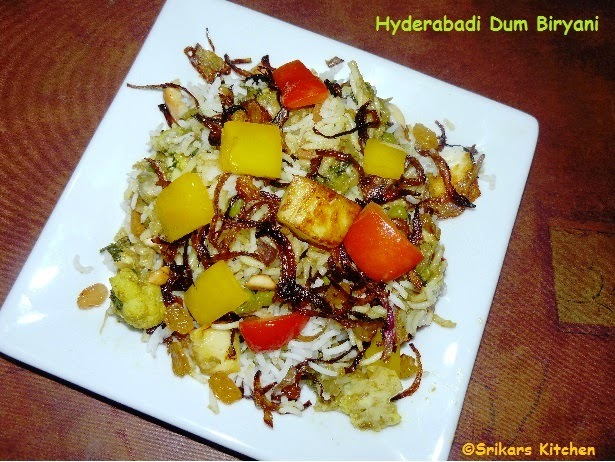 Dum Biryani is a very famous rice dish in southern india especially from Hyderabad. This is very flavourful and tasty dish. Normally making this dish very special occasion with special guests. Dum means cooked with slow heat . Basically 'Dum' is term which indicates the way it's been cooked. All parts of the dish are cooked separately and assembled and finally finished with heat both at the top & bottom or all ingredients are mixed and finished with heat both at the top and bottom to attain complete flavour.We can make this dum method in oven also. Mix all the ingredients & keep it aside min 30 mins. Deep fry the sliced onion Until golden colour. Heat ghee in a pan add cashew, raisin allow to roast & keep it aside. In same pan add little oil shallow fry the both capsicums & keep it aside. Add little oil in that pan, roast the paneer & keep it aside. Heat oil in a pan, add cumin seed, cardamom,cloves, cinnamon stick & allow to temper. Add sliced onion & allow to saute until light brown colour. Add the Marination ingredients & mix well. In meanwhile semi cook the carrot,potato,beans in the micro oven around 5-7 mins. keep it aside. Allow to cook until raw flavours extracts, add cauliflower & rest of the all vegetables & cook well. Finish with coriander leaves & keep it aside. Take a pan or any vessel apply little ghee in it. 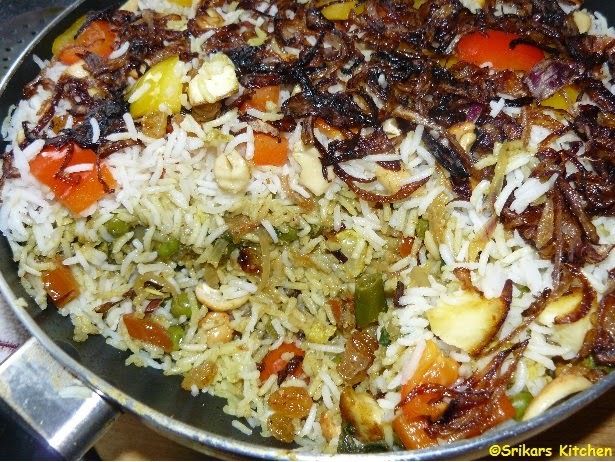 Add rice in one layer and veg masala one layer, add fried capsicum, cashew, raisin, panner & fried onion. Do this process 1 or 2 times more. Take one vessel add water & allow to boil , keep the pan with the assembled rice & veg inside the pot filled it water. Cover it as shown below. Allow to slow DUM for min 30 mins & serve with Raitha.